We are having a gorgeous Labor Day weekend this year! We’ve had the doors and windows open, the A/C off, and it’s been great. Yesterday, we invited both sets of our parents and Bill’s brother and his wife over for dinner. We were able to kill a variety of birds with this stone: 1) having guests over forced me to clean the house, which I admit I do far too infrequently; 2) we haven’t invited parents over to our house in years so it was long overdue; 3) and I keep saying I want to entertain so this was my chance! We had a casual dinner and I tried out 3 new recipes. Unfortunately, I only have pictures of 2 of them. First up is a pork BBQ recipe from my Friend, Dani. I knew I wanted to do BBQ sandwiches but my dear husband is a little on the picky side when it comes to this. He doesn’t like BBQ to be too “ketchup-y” so since Dani’s recipe had only 1 cup, I thought it would work – and it was great!! 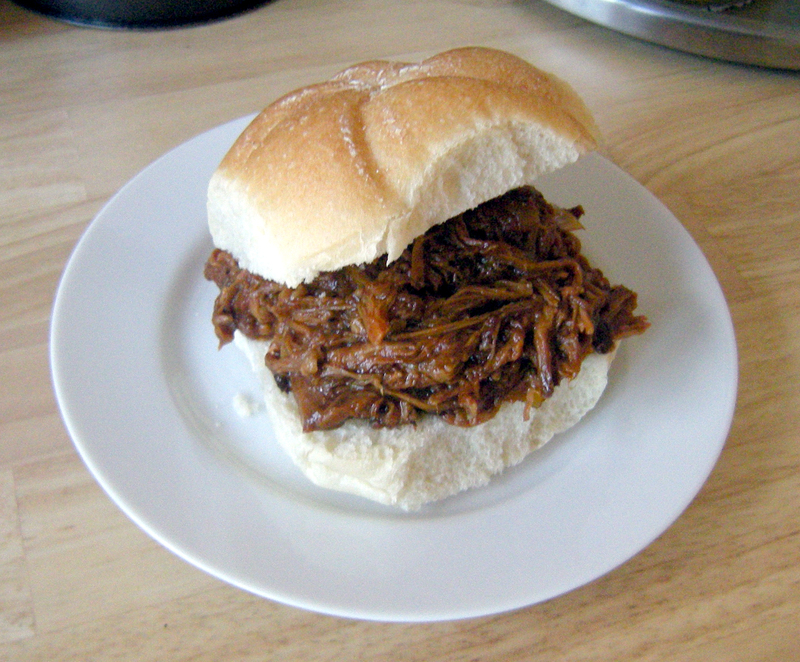 I put everything in the slow cooker on Saturday night and woke up Sunday morning to the delicious smell of BBQ! I shredded it easily with a fork and kept it on warm until dinner time. I am definitely saving this recipe! And what goes great with BBQ sandwiches? Well macaroni and cheese of course! I went on the hunt for a good recipe and I ended up with Pioneer Woman’s. Her pictures just looked so good, I was sure it would turn out well. I made it up the day before and reheated it before serving it. It was definitely good, but I think it would have been even better if it was served immediately after it was made. The 3rd thing I made was another Pioneer Woman recipe – a peach crisp/cobbler. It was fantastic! I didn’t make the maple cream to go with it though. We served it with vanilla ice cream. 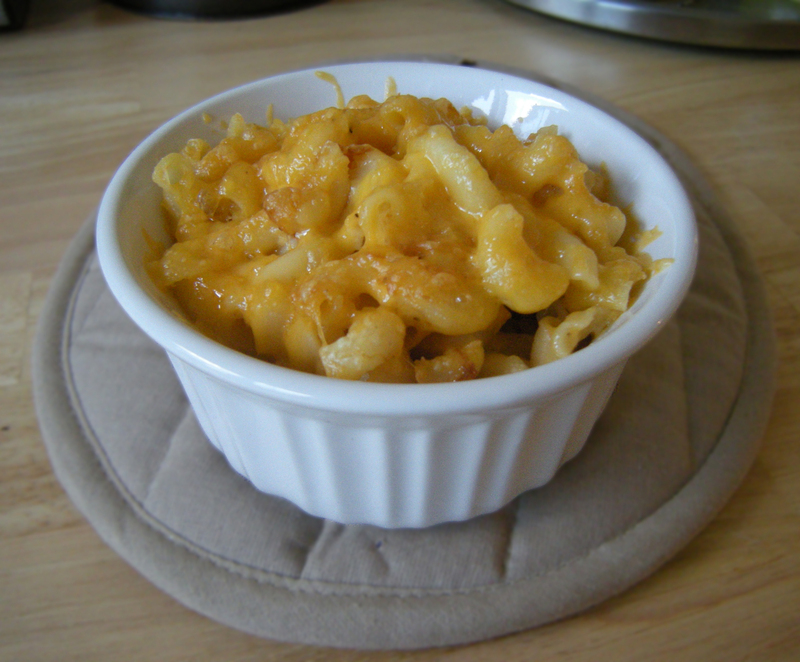 As with the macaroni and cheese, I also made this ahead of time and reheated it. Although in this case, I don’t think it had any effect on how delicious it was. I can’t wait to make it again!